Blau’s many-layered images breathe magic and are always good for surprises. 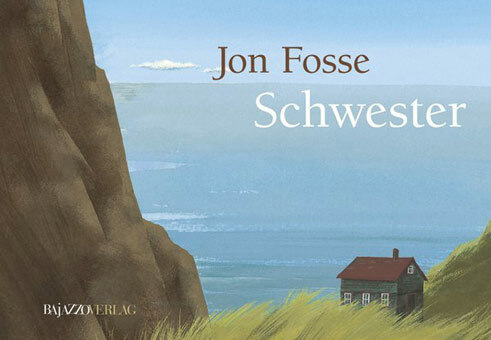 In the meantime he has designed over thirty books and received numerous prizes, including the Troisdorf Picture Book Award, the German Youth Literature Prize, the Austrian State Prize for Children’s and Young People’s Literature and the Bologna Ragazzi Award. 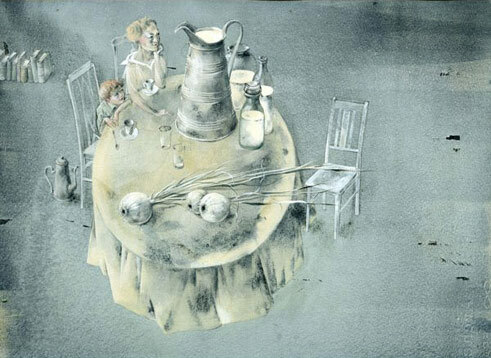 The list of books and publishing houses for which Aljoscha Blau has done illustrations is long: whether Nikolaus in Not (i.e., Nicolas in Distress) for Insel Publishers, Die Geschichte der Wirtschaft (i.e., The History of Economics) for Beltz or Kamel bleibt Kamel. 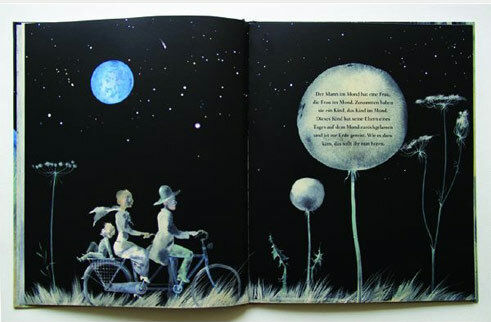 Äsops Bilderbogen (i.e, Camel remains camel, Aesop’s Illustrated) for Residenz Publishers or Das Kind im Mond (i.e., The child of the Moon) by Jürg Schubiger for Peter Hammer Publishers, Rote Wangen (i.e., Red cheeks) and Der Ritt auf dem Seepferd. 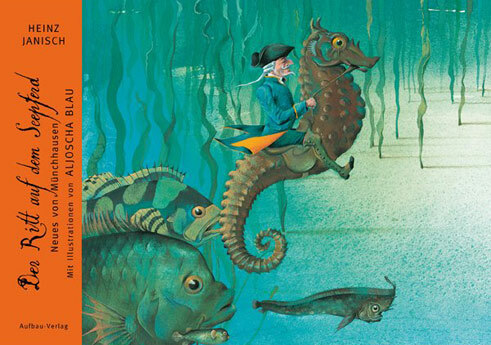 Neues von Münchhausen (i.e., The ride on the sea horse. 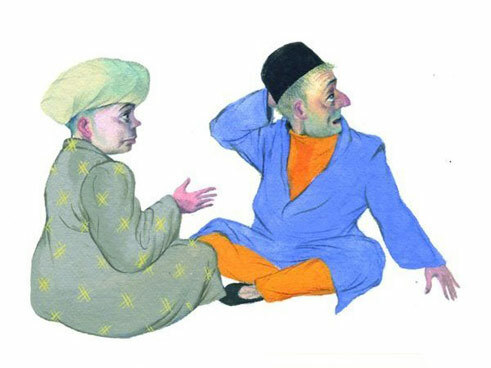 News von Munchhausen) by Heinz Janisch for Aufbau Publishers, Das Kopftuch meiner Großmutter (i.e., My grandmother’s headscarf) for Bajazzo Publishers and Das fliegende Kamel (i.e., The flying camel) by Paul Maar for Oetinger Publishers. The wealth of forms in Blau’s illustration immediately catches the eye. The spectrum that he quite deliberately deploys ranges from reduced ink drawings and fantastic worlds of colour to collage-like interleavings of text and image: “Because no story is like another, the illustrations have to show this difference”. 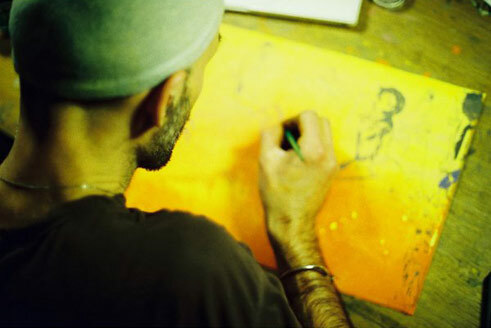 Blau’s artistic career began behind the Iron Curtain: in his hometown of St. Petersburg, then still called Leningrad, he attended a children’s art school; 1990 he moved to Germany and studied illustration and graphic arts at the Design Department of the Hamburg University of Applied Sciences. 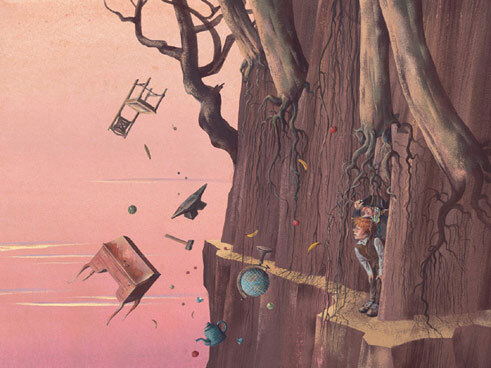 The first book that he worked on as a freelance illustrator was The Five Fingers and the Moon (Die Fünf Finger und der Mond) by Kemal Kurt, a fairytale-like story in which goblins, dwarves, fairies and elves band together. 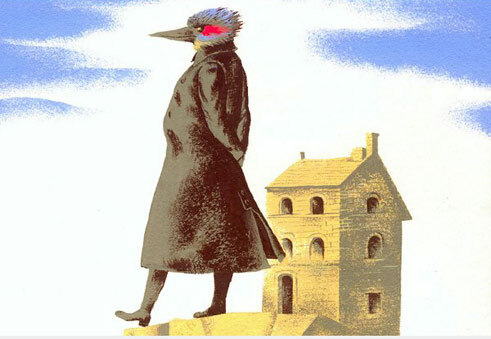 It was his first small success, chosen by the German Academy of Children’s and Young People’s Literature as the picture book of the Month in December 1997. 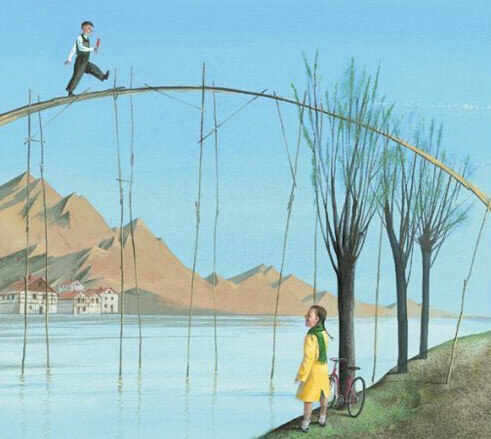 In his work as a freelance illustrator for newspapers and magazines we can therefore always recognize the playfulness that we know from Blau’s children’s books. Even when he treats as dry a subject as networking in a French hospital, for example, he never delivers mere schematic diagrams but rather a network of coloured lines that set friendly doctors, helpful nurses and hopeful patients in relation to each other. In an interview, Aljoscha Blau said of one of his books that he had only “dressed” it. The same modesty is expressed by his illustrations, which never take themselves too seriously and so bring the world humorously back down to earth. 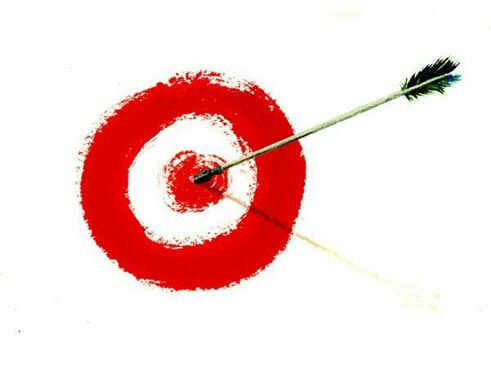 Fabian Thomas is a freelance editor in the field of culture and literature.